1. Clothes Dryer – Beware that this trick works best for canvas tennis shoes and may ruin athletic runners. Also, many dryer manufacturers warn against putting shoes in the dryer, as it may damage the machine. However, the folks at Parent Hacks came up with a clever solution: they recommend running the dryer on low and tying the shoes to the door to prevent that annoying thumping sound and protect your machine from damage. There are also a few handy products on the market, such as the one below, designed to keep your shoes secured to the door. 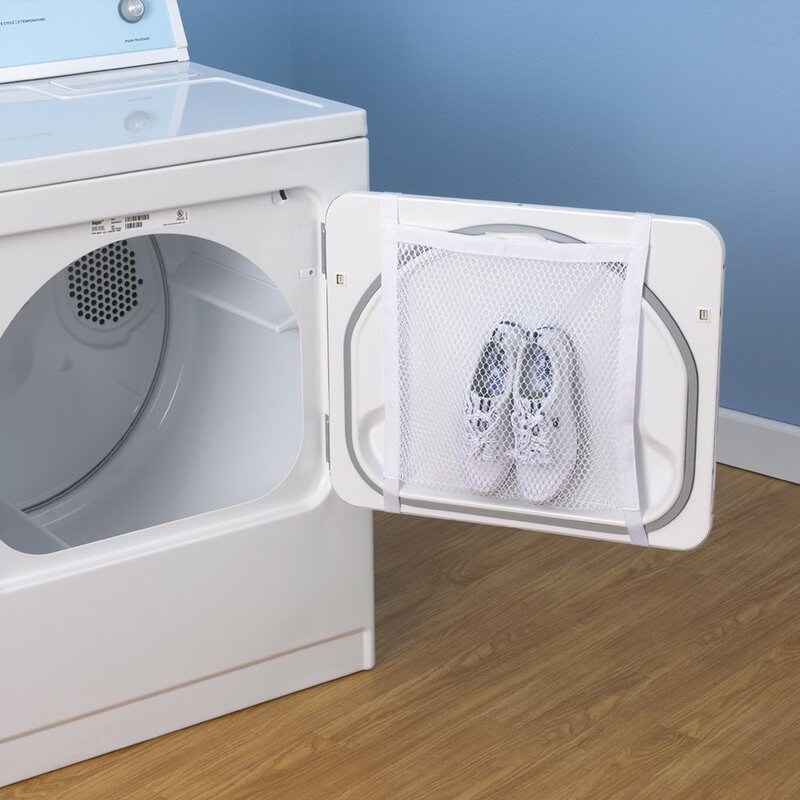 This mesh bag attaches to your dryer door to keep shoes secure during the drying cycle. 2. 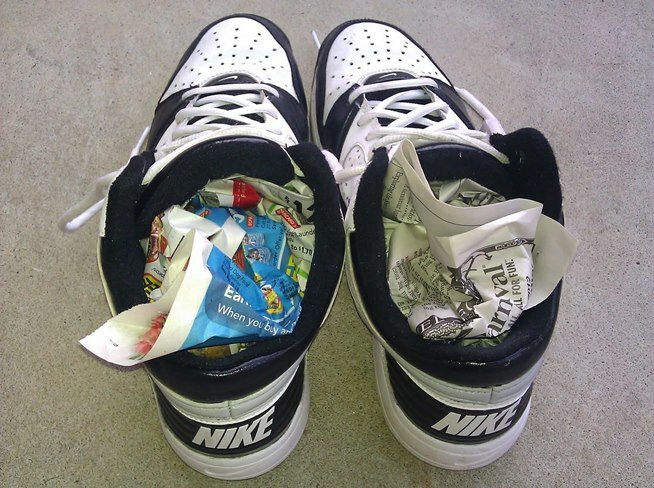 Newspaper – Ball up wads of newspaper and shove them into your shoes. To dry the exterior, wrap the shoes in paper and hold it on with rubber bands. You may have to replace the soaked newspaper several times, but eventually the paper should absorb the excess moisture in your shoes. Your fingers may turn a smudgy gray… and the insoles of your shoes may also look dirtier… but at least your shoes won’t be havens for fungus! Newspaper is one way to dry out those soaked sneakers. 3. Heater Vent or Fan – Place your shoes next to a heater vent or a fan to get better air circulation than your shoes would get stashed in your closet or the hallway. This method could take hours, so it’s best if you have the time to spare. 4. 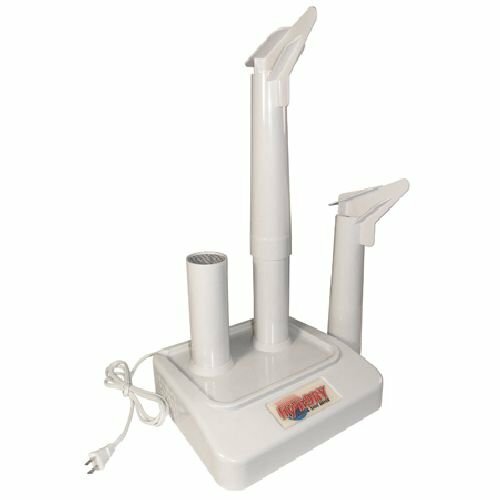 Boot & Shoe Dryer – The Prago Hy’n Dry Boot & Shoe Dryer by Weston collects dirty water dripping to keep your floor clean, while using thermal convection heat to dry the insides of your footwear. Similar products are offered by manufacturers like PEET, Maxx Dry, and Dry Guy. This contraption uses convection heat to dry out those wet shoes. 5. StuffIts – For $25, you can get the StuffIts shoe inserts that combine moisture-wicking fabric and cedar filling to draw out the moisture and mask smelly shoe odor. An antimicrobial coating is designed to prevent pathogens from growing on the inserts themselves. Seventeen Amazon reviewers give it 5/5 stars. 6. The Sun – The ultraviolet sun rays work wonders to zap many pathogens from your footwear, while also drying them out. On the downside, you could warp and fade the color of your shoes. And if it’s still raining when it’s time to dry out shoes, then there probably isn’t going to be enough sunlight to help out. 7. SteriShoe UV Shoe Sanitizer – You may have seen this product on “The Doctors” TV show or read about it within the pages of InStyle Magazine. The SteriShoe ultraviolet shoe sanitizer is the only scientifically-tested product guaranteed to kill up to 99.9% of the harmful viruses, bacteria and fungi residing in your shoes (including Staph, MRSA, and the fungi that causes athlete’s foot & toenail fungus) within 45 minutes! We have found a way to safely harness ultraviolet energy to sanitize footwear like hospitals sterilize tools and patient rooms. It has the American Podiatric Medical Association seal of approval and is widely recommended by podiatrists across the country. 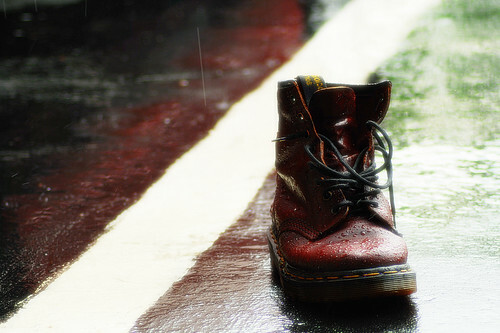 Get Rid of Wet, Stinky Shoes for Good! Customers have told us that they love how the SteriShoe UV shoe sanitizer dries out their shoes, while also killing bacteria, viruses, and fungi that they may have picked up walking through puddles. While it’s true that the replication of bacteria is the ultimate source for the pungent odors inside our shoes, some people find it’s not enough to get rid of the bad smells in shoes that have been stinking for months or even years. So we recommend using our product alongside something like Kiwi Fresh Force to have truly sweet-smelling, dry, microbe-free feet. Try the SteriShoe UV Shoe Sanitizer RISK-FREE for 30 Days! We find the biggest advocate for our product are doctors, diabetics, parents of kid athletes, and people who have suffered from foot fungus in the past. We understand there are many methods for curing wet, smelly shoes and that money is precious, which is why we’re offering a trial of our ultraviolet shoe sanitizer risk-free for 30 days. If you like the product, keep it for $129.95. If not, you will receive a full refund without hassle.